This six-month program is fun for new, recreational and developing paddlers. Children start in our Mini-Lightnings learning the basics of Sprint Kayak and may take part in an occasional beginners regatta, at coach’s discretion. Intake from ages 8-12 years (flexible). It runs three days a week, after school Tuesdays & Thursdays 4-5:30pm AND Saturdays 11am-12:30pm. Membership is from April through September. Occasional schedule adjustments and additions may occur throughout the season. Register now, limited spots available. 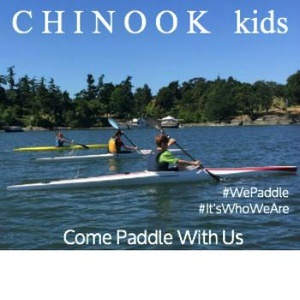 Chinook is Victoria’s Sprint Canoe Kayak paddling club offering children and youth recreational to competitive paddling. Join in April through August for beginners Sprint Canoe Kayak, ages 8-13. Come for the friends, fun and festivities!